Angels On Horseback Oysters are basically broiled bacon wrapped oysters. These appetizers are so easy and simple to make and delicious to eat! They are wonderful for entertaining since they can be prepared in advance and then simply grilled a couple minutes before serving. The juices from the bacon melds into the oysters when grilling giving the shrimp a heavenly bacon flavor that no one can resist! If you have never tried oysters, this is a delicious way to introduce yourself to them. My husband and I can make a dinner of these Angels on Horseback Oysters! Give them a try – if you are an oyster lover, you will not be disappointed. Preheat the broiler of your oven. Drain oysters. In a bowl, mix the wine, garlic, salt, pepper, and hot sauce together. Add drained oysters and toss to coat; let marinate 20 minutes. Cut the bacon in half and cook in a microwave oven for approximately 1 minute or pan fry until the edges begin to curl but the bacon is still flexible(do not completely cook the bacon). Drain well. Remove oysters from marinade, Wrap each oyster in a bacon strip and secure with a damp wood toothpick or wood skewer, overlapping the bacon approximately 1 inch. 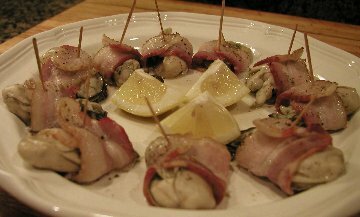 Place the bacon-wrapped oysters on a broiler pan. Cook the oyster and crisp the bacon approximately 5 to 6 minutes on the first side, and another 2 to 4 minutes once you turn them over. You will need to turn them once or twice to get a good crispiness on all sides. NOTE: You may also cook these "angels" on an outdoor barbecue or range top grill. Serve immediately with the cocktail pick, or the pick can be removed and the oyster placed on a buttered toast round. Serve with lemon wedges. Some people like to serve these oysters with cocktail sauce or hot pepper sauce. * Check out How To Shuck Oysters. You can also use canned shucked oysters found in the refrigerator section at the seafood counter of your grocery store (this is what I do to save time). If you absolutely don't like oysters, you could substitute scallops or shrimp. ** I like to use smoked bacon. Oysters can be cooked in their shells on your barbecue grill. The heat from the grill steams the oysters and pops the shells open, while poaching the oyster inside. We had an oyster feed in our winery this Spring. I have never had oysters that tasted this good before. They were so easy to make and so absolutely delicious! The oyster cocktail, a popular West Coast treat, originated in a San Francisco restaurant around 1860 by a miner back from the gold fields. Makes a wonderful first course for your dinner party or just as a treat for your oyster lovers! To those people who love oysters, there is little that can compare with a cold, plum, raw oyster that is sipped from its shell. Served with a homemade Mignonette sauce or cocktail sauce and it is perfect!